NB: This article describes a means of generating 12V from a 6V Austin, which can then be used to power any 12V item up to 800mA. This would include many car based accessories. NB: The citing of specific products, parts and the suppliers in these articles is for accuracy and does not imply endorsement or recommendation. However, before you build, be advised that USB powered devices rarely need more than 6V input into their charger adapters. 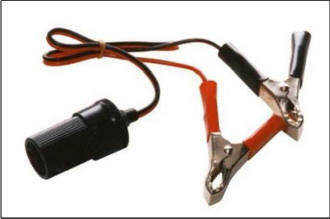 If your accessory has a connector as shown below, it is unlikely that the 12V converter will be necessary. Simple solution – try it first! Many of us enjoy our 'Sevens' on unfamiliar roads or over considerable distances, both at home and abroad. Maybe to some distant rally, maybe over a new route. Until recently, this necessitated a pile of good maps and a passenger to read them. However, we now have a few more options. A member contacted me to ask if it were possible to make a device that would keep a sat-nav system charged up when used in a car running on 6V. Sat-Nav devices work fine for a few hours, but if you are out all day, rarely have enough internal battery power to keep going. I had made a small converter with enough power to charge up a mobile phone, but a sat-nav is an altogether hungrier beast. A quick surf on the net revealed that there is a device on the market that can be adapted to generate 12V from 6V. This is a “Simple Switcher”® step-up voltage regulator made by National Semiconductor, (part number LM2577-ADJ). Together with a few extra components, a heatsink and some wiring, it is possible to generate over 1A from the battery of an Austin. The output connector is taken from a car charger extension lead, so that a phone or a sat-nav just plugs straight in. So as to best replicate the power available from a modern, I chose to generate 13.5V rather than 12V, which has the benefit of being a better match to sat-nav chargers, mobile phone chargers and even SMALL car inspection lamps. If you really wanted, it would even power a CB set or a normal car radio – not that you’d be able to hear it on the move! A prototype was assembled, and has been on trial in a number of cars during recent trips. I have to say I’m pretty pleased with how well it works, and so now offer it to other members. For those with a technical bent, I have included the circuit below. There are a few important precautions to observe to get the best out of it. Firstly, the regulator will need a heatsink, preferably one with some fins. Secondly, the input capacitor must be as close as possible to pin 5 of the chip – not remote by a length of wire! The inductor should be a toroidal type, rated to at least 4A, and the output capacitor must have a low ESR. The parts supplier (Farnell Components) has a minimum order charge, and the approximate cost for parts is £25. It all fits into a small plastic box, about 3½" x 2" x 1½", with a trailing socket like the one in the dash of your modern. On the other end will be two lengths of wire, one red (positive) and one black. In addition you will need the appropriate terminal, (bullet terminal, ring tag or whatever - chosen to suit your car) and an in-line fuseholder. I had a spare hole in the dashboard, so I popped in a switch so it’s only in use when I need it. Fitting is very simple. Assuming the car is fitted with a battery isolator, (as all cars should be to prevent risk of fire), the module is simply connected to the output of the isolator via a 5A fuse. This is necessary as the converter consumes a small amount of power all the time, about a tenth of an amp, so would otherwise flatten the battery whilst the car is not in use. If you have no isolator, the (very second best) place is on the output of the ignition switch. Don’t connect the supply to the IG side of the ignition coil as there are too many spikes on the supply and the chip will not survive. As for mounting, mine lays in the glovebox, so that the wire to the sat-nav is not in the way. This article, written by Geoff Hardman, originally appeared in CA7C Seven Focus in Jul 2008 pp25-26. Garmin Satnav – 6V operation. I’ve recently had communication from a Chummy owner, who is attempting to use a Garmin Satnav directly from his nominally 6V car. It’s giving him a bit of grief:. However, there are other 6V owners who are using them quite happily, with nothing more complex than a cigarette lighter connector, a fuse and a bit of care to ensure the correct polarity. (The “tip” MUST be Positive; the “sleeve” MUST be Negative, irrespective of whether the car is positive or negative Earth). All you need is a cigarette lighter style socket, that you can get either trailing if you don’t want to drill any holes, or captive if you don’t mind the metalwork. I use a trailing one. The easiest way is to buy a Cig lighter adaptor fitted with a short lead and (usually) crocodile clips. Just cut the clips off and wire up via a fuse, 1A is plenty. Make sure that the centre point is connected to +ve and you’re done. It can be purchased at any camping, outdoor, motor accessories shop. 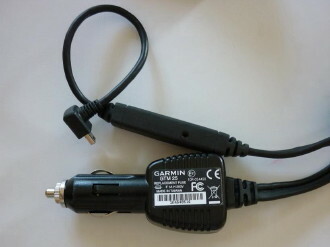 I have a Garmin Nuvi 1490 that I use in conjunction with a home made 6V to 12V converter, described above. However, I know for a fact that the very same model works very happily in a 1934 5cwt Van running straight off the 6V battery. So, I did some investigation. I connected up the Satnav using a mains – derived laboratory power supply to feed an in-line cigar lighter socket. Crucially, this model of Satnav has a Traffic Message Channel (TMC) receiver built in to the power lead (Garmin part number GTM25) , which is how the Satnav gets its road block information. I gradually reduced the voltage whilst watching for the point at which the Garmin reported “External power lost” on its screen. At this point, I have 30 seconds to either increase the supply again before it shuts down, or touch the “stay on” message and use internal battery power. The results varied a little bit with temperature but they are summarised below. This effect, where the “lowest” voltage is greater than the “highest”, is known in the trade as hysteresis, and is a deliberate design feature. This means that the behaviour at some middle voltage is dependent on the direction the voltage is going. That way, you don’t get a rapid “chatter” from On to Off when the voltage fluctuates a few millivolts. Out of curiosity, I monitored the current, and found that as the voltage reduces from 12V down to 6V, the current actually goes UP. This is the characteristic of a switched mode power supply, that in theory can have LESS volts on its input than on its output. (That’s how my home made converter works). I found that the drop out voltage coincided with the converter taking exactly 500mA: I assume the designers decided that at this maximum input current, it should shut down to protect itself. My correspondent was hoping that I could suggest how to get round his problem. One option might be to use an aftermarket 12V to USB converter. 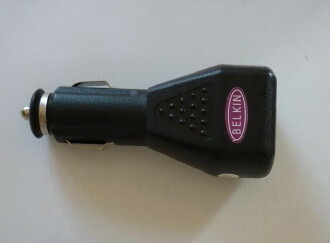 I had a Belkin USB-CLA to hand available from Halfords, and tried that too. Here I hit a snag. Like the Garmin, the Belkin is a switched mode, with its current rising as the voltage fell. So far so good. However, instead of being a few tenths of a volt below 6V, it cut out at about 6.7V. When that happened, the Satnav didn’t gently go to sleep: rather it assumed that it was connected to a computer and went in to USB Update mode. The only way out of this was to increase the voltage to 7.2V and press the power switch. Clearly, that would be a right pain if you were trying to follow a route and drive at the same time. So, the only advice I can offer is to use a genuine power lead preferably one with the TMC receiver built in, and keep the voltage at the connector north of 6.0V. Sadly, using an aftermarket alternative doesn’t appear to do the trick. The problem can be solved by generating a USB supply directly. This article, written by Geoff Hardman, originally appeared in CA7C Seven Focus in Jul 2014 pp20-21.